Make your deck look as on-trend as the rest of your home. 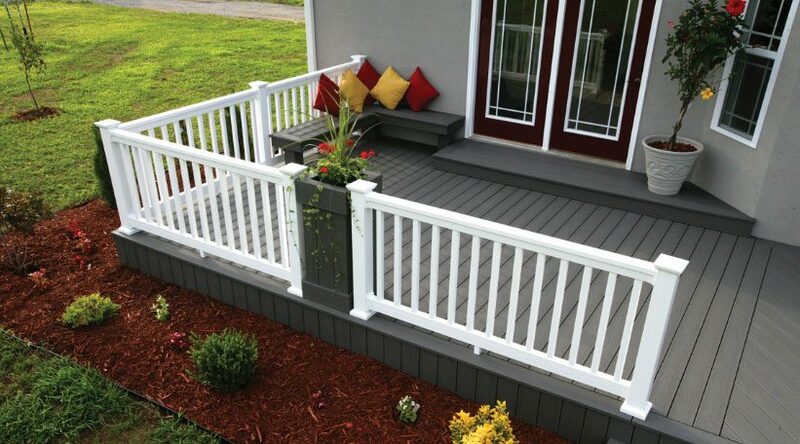 Just like you can have a coordinating palette for the exterior of your home, you can create a palette for your deck with a color scheme consisting of different hues for the floor boards, spindles and railings. Here are some suggestions for pulling off the perfect scheme for your deck. The first thing you should do is consider the style and color of the rest of your home. You want your deck to be a nice complement to the rest of your exterior—not stick out like an odd afterthought. For instance, a light gray stain works very well with Cape Cod style homes, which often have a gray or white façade themselves. Light brown or cedar typically goes better with dark-colored homes and is especially compatible with homes in rustic settings. Using a transparent or semi-transparent stain is generally more compatible with a rural or suburban home, whereas a semi-solid or solid-color stain would be more appropriate for urban homes and townhomes. Also consider the landscaping around your home. For instance, more natural tones are more appropriate in a backyard where the foliage is abundant and the deck is almost an extension of the outdoor vibe you are going for. A tried-and-true method of staining your decks is to use the same color on every wooden surface—i.e., the floor boards, the spindles and the railings. That actually works better with a small deck where you don’t want the color contrast to draw attention to just how small the space may be. If some contrast is desired, it can be accomplished by using metal deck balusters as a break between the deck stain on the floor boards and top railings. For instance, painting or staining the spindles white in contrast to the brown or gray floor boards is a classic two-toned look. You can make the top railings the same color as the spindles or the floor boards—it’s up to you. Carry the contrast through to the deck steps, where you can stain the horizontal stair pieces the same as the floor boards and use white on the risers. Another classic color combination is to use a forest green paint or stain for the spindles to contrast with the brown or cedar tone of the floor boards or railings. So far, we’ve mentioned classic deck colors like gray, brown and cedar for the floor boards and white or green for the spindles, but you can get a little more creative by using colors that trend toward deep blues, seafoam greens or even smoky purples. If you have a good eye for color, don’t be afraid of exhibiting those talents when it comes to staining your deck.